Today is Earth Day 2013, and it’s a time for business owners to think about their green initiatives and the things they can do to be more green. Office Depot surveyed 1,000 small and medium-sized business about their environmental consciousness, and they had some really interesting results. I want to share some of the highlights—maybe they’ll help your thinking about these questions. A lot of small business owners are thinking about ways theycan make their business more green. 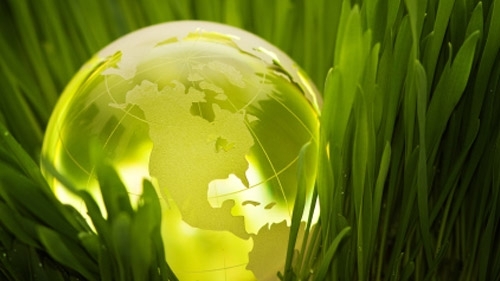 In the past year, 20 percent of small businesses have increased their green activities. The number is even higher for businesses that are planning on going greener in the next year—34 percent. There are many reasons why businesses are motivated to go green. The most common, cited by 76 percent of businesses, was a genuine concern for the environment. But that’s not the only reason. Nearly half—49 percent—were motivated by the money they could save going green, and 20 percent were inspired by employee encouragement and participation. Of course, when people talk about green business, the first product option that people think of is usually paper—and Office Depot’s survey found that paper was indeed the number one product that business owners mentioned they would be willing to invest in for their green efforts, at 70 percent. But a number of other products were regularly mentioned, such as ink and toner (55 percent), cleaning supplies (54 percent), and lighting (48 percent). The most popular green initiative for small business owners is recycling, at 72 percent. Another 59 percent said they were working on reducing waste, 58 percent are buying energy-efficient products, and 57 percent are buying recycled products. There is a wide range of possibilities for the business owner looking for things to do to be greener. A major concern for every business is always cost, and that is certainly a factor when it comes to green initiatives, especially up front. But 36 percent of small business owners surveyed said they would pay more money up front for green products if they would save money in the long term. On top of that, 57 percent would go for the green product if it’s priced the same as a comparable regular office product. Immediate Cost Savings. Some green initiatives will save you money immediately, by being cheaper outright than regular competitors. Price Parity. There are a lot of times you’ll have the choice between a green product and a comparable regular product, and the two will cost about the same. In that case, going green has no effect on the bottom line, but does help on the green side. Higher Initial Cost with Lower Operating Cost. Sometimes a green product will cost you more up front—but done right, you’ll save money in the long run. Once you’ve cleared the initial cost hurdle, you can begin to reap the rewards. Fran Tarkenton is an entrepreneur and NFL Hall of Famer, and the founder of Tarkenton Companies. Fran has always had a passion for small business, and has started more than 20 businesses since retiring from the NFL. His efforts to provide knowledge and tools to small business have been a full time undertaking since 1996, and he is the driving force behind GoSmallBiz.com, Click2Corp.com and Tarkenton Financial. These sites all grew from Fran's desire to help fellow entrepreneurs gain access to the tools and information they need to grow and compete in the modern economy. You can see more about what Fran is doing at http://www.tarkenton.com, follow him on Twitter @Fran_Tarkenton, or connect with him on Google +.